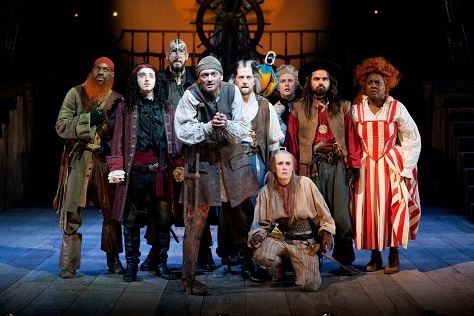 There's action on the high seas at Birmingham Repertory Theatre this Christmas with a new stage adaptation of Treasure Island. The Robert Louis Stevenson novel may be getting on for 200 years old but it still has the power to excite with a host of memorable characters including the cabin boy Jim Hawkins and the one-legged pirate Long John Silver. 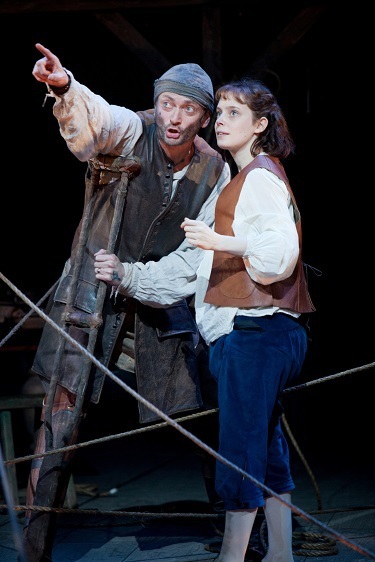 In this production, written by Bryony Lavery and directed by Phillip Breen, Jim is actually a girl – but a girl who dreams of adventure, long distance shores and treasure. And her dreams become reality when a mysterious guest arrives at her grandmother's inn. Billy Bones is in hiding, having betrayed his shipmates and stolen a map to Treasure Island. Once discovered, he is soon despatched by the motley crew of pirates and in his trunk Jim finds the map. And so begins Jim's journey to Treasure Island but it's a journey in which the youngster will be tested well beyond her wildest dreams. Sarah Middleton plays a lively Jim – constantly sharing her thoughts with the audience, we understand her desire for adventure but also fear for her as she steps into unknown lands. Her never-ending optimism reveals her childlike nature and ensures she can succeed where adults cannot. Michael Hodgson is Long John Silver, whose silver-tongued duplicity initially tricks Jim into believing they are friends – when all along Silver is only aiming to keep the treasure for himself. The set, designed by Mark Bailey, is dominated by the treasure-seeking ship, the Hispaniola, on which the characters can plan, fight and kill. There are also a few tricks up Bailey's sleeve in the set but to share them now would be telling. 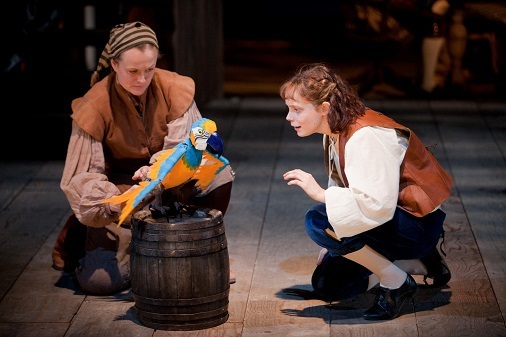 There's also clever use of puppetry, ensuring Silver's parrot, Captain Flint has plenty of opportunity to fly high. A non-stop adventure, Treasure Island is a family show which offers something different from the usual panto.